I love to cook. Unfortunately, however, cooking for pleasure is very different from having to prepare breakfast, lunch, and dinner seven days a week, 52 weeks a year. For many of us, preparing meals can seem like a relentless chore that has to be fitted into an already hectic schedule. It is very easy to resort to picking up take out or throwing a frozen pizza in the oven. And while there is no problem with doing that every now and then, in terms of health, it is best not to do it every night of the week. So how do you fit healthy food preparation into a busy lifestyle? 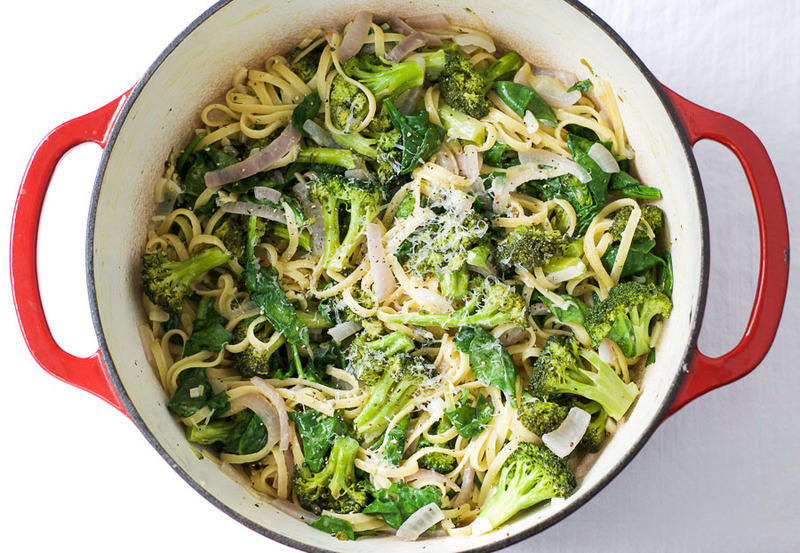 The answer is to have a bank of easy, healthy meals that you can make with very little preparation… like this one pot broccoli parmesan pasta. I only came across one pot pasta recently. I thought it was going to be a mushy mess. Instead, it turned out to be the most delicious way to cook pasta. Why hadn’t I been doing this all my life? The pasta soaks in the wonderful flavors from the other ingredients to create a fantastically tasty dinner. 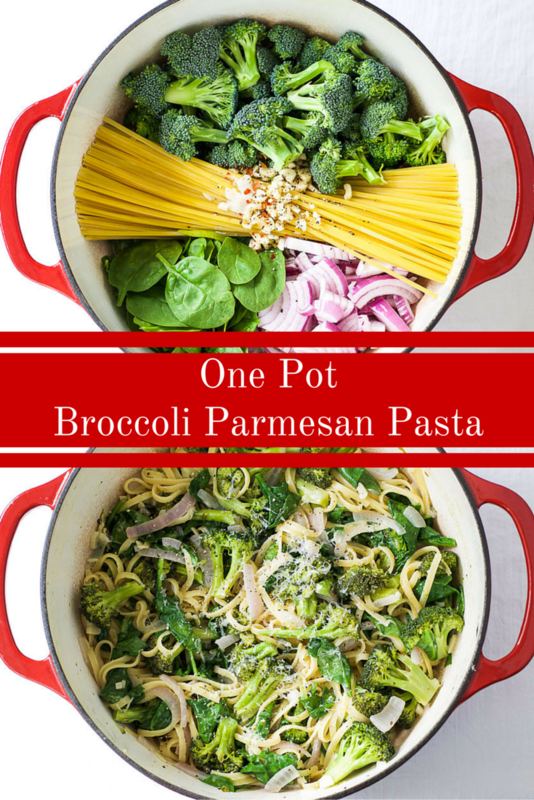 In this version, you simply put the onion, garlic, olive oil, broccoli, pasta, broth, and seasonings into a pot, simmer for 9 minutes, throw in a little whole milk, spinach, and parmesan, and dinner is served. Fast, delicious, and nutritious. Not only does one serving of this meal provide you with a whopping 14 grams of protein, it also contains nearly 200% of your daily vitamin C needs, 75% of your daily vitamin A needs, and 20% of your daily calcium and iron needs. 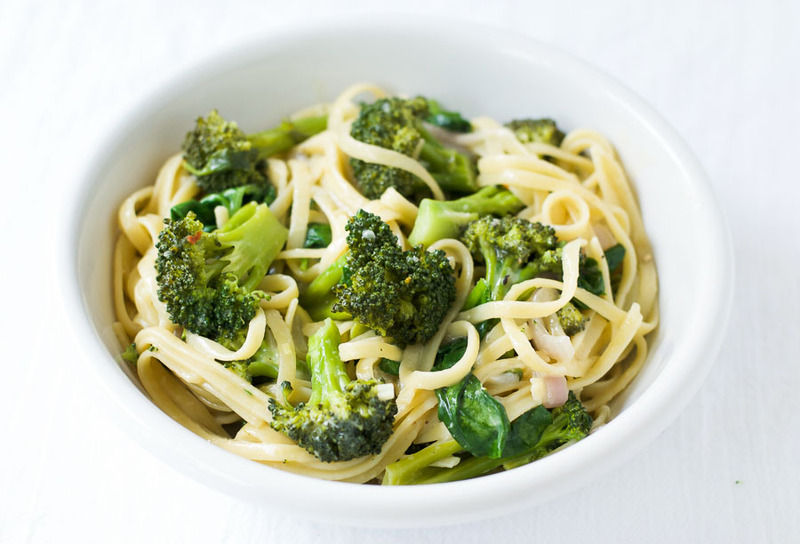 So if you are looking for a quick and easy weeknight dinner, look no further than this one pot broccoli parmesan pasta. 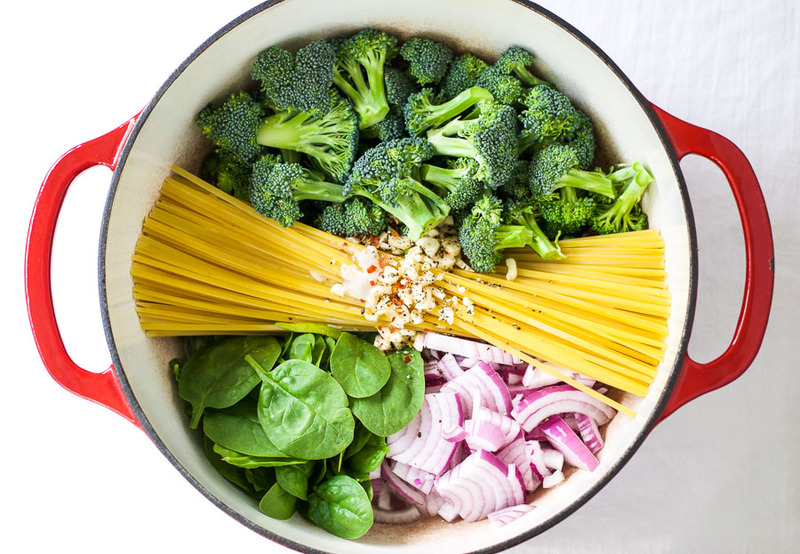 This delicious and nutritious one pot pasta makes the perfect quick and easy weeknight dinner. In a large pot or Dutch oven, put the onion, garlic, olive oil, broccoli florets, linguine, broth, salt, pepper, and chili flakes. Bring to the boil, then lower the heat and simmer gently for 9 minutes, stirring occasionally. Try to make sure the pasta is submerged in the broth as much as possible, and the broccoli is on top. If the pasta starts to stick, add a little more water. After 9 minutes, add the milk, spinach, and parmesan. Stir gently until the spinach has wilted (about 1 minute). One pot of healthy foods! I love them too. I’m amazed that I ever cooked pasta in plain water! I hope you like it. Love how this sounds… I think I’ll skip the milk though and add some chicken breast. Thanks for your comment Danielle. I love the idea of adding chicken. Yum! Made this tonight. I used chicken stock and cut up chicken breast for some meat (hungry hard working men & women in this house) it was so so SO good. also didn’t have linguini so I used Campanelle and it worked great. Only deviation was that I used some Meyer lemon Himalayan salt. Scrumptious! Definitely saving this recipe and it took almost no time to make! Hi Danielle. Thank you so much for the great feedback. Your modifications sound fantastic. Meyer lemon Himalayan salt sounds divine!